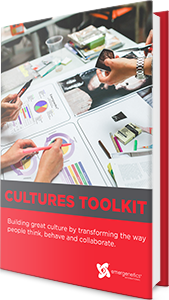 Build a more collaborative corporate culture that increases productivity and profitability. 36% of an organization's performance can be attributed to collaboration1. Collaboration significantly impacts profitability, profit growth and sales growth more than strategy and even market fluctuations. 9 out of 10 managers across the globe agree that better collaboration leads to higher productivity2 and positions their organization to better capitalize on new opportunities. How do you create a workplace culture that fosters collaboration? At Emergenetics we take a bottoms up approach: we understand the Thinking & Behavioral Preferences of individuals, and your organization. Using this information we help organizations create a common language that facilitates collaboration and engagement. Emergenetics International © 2014. All Rights Reserved.